Wallace “Ace” McGregor ran off to chase the rodeo, but not before playing the knight in shining armor to his best friend Cheyenne Murphy after a tragic assault left her pregnant. With his latest injury leaving his chase for rodeo gold in the dust, he finds himself back home. Haunted by the past and trying to do what he thinks is right, he will have to mend his relationship with the best friend he all but abandoned in her time of need and the older brother he left holding the bag. Cheyenne Murphy’s life hasn’t been easy. Now the man who’d left her broken and pregnant has re-surfaced and is threatening to destroy the safety and family she’s found at McGregor Ranch. At risk of losing her son and destroying the McGregor family, she will do whatever it takes to ensure they are all safe, even if it means relying on the parents that disowned her. When everything is on the line, will Wallace and Cheyenne come to realize that in life and love, they are anything but safe? The bed dipped, his weight tipping her slightly toward him, as he shifted to face her. “Holden’s in the yard with Quinn. He’s fine.” He placed his arm on the other side of her legs, where they stretched out beside him. She couldn’t look at him. Didn’t want him to know how shook up she was, or what had taken place at the market. With his free hand, he tilted her chin up so she had no choice but to meet his gaze or act like a child and keep her eyes closed. The concern in his gray eyes was enough to make her want to crawl up on his lap and cry, as she’d done so many times in the past. But she couldn’t. Not this time. “Just bad dreams again, same as always.” Only worse now, for reasons she couldn’t share. “What? How could you…” Crap. Holden was a smart kid and had seen the man. Not to mention Maggie, who would usually take a secret to the grave, wouldn’t have kept Garth’s reappearance in Asheville quiet. If Mr. Johnson was bothered enough to come over, he would’ve made sure word got back to Wallace. Whole town probably knew about the incident by now. Small towns were filled with gossip mongers. “Don’t be mad at Maggie or Holden.” He ran his thumb along her jawline. She didn’t say anything. Couldn’t. Eight years ago, Garth hadn’t been pounded to a bloody pulp by the McGregor boys due to her pleading for Wallace not to leave her side. The stakes were different now though. She wasn’t blood, but they’d do what it took to protect her and the boy they felt was rightfully a McGregor. Moira Keith is a lover of shoes, a connoisseur of Guinness, baker of cocktail themed cupcakes, and an overall complete mess! Moira lives in the glittering sea of neon known as Las Vegas with her twin zombie sons, three parakeets, and a turtle. but is a proud Texan by birth (and true Southern girl at heart). As a writer, she loves to envision many worlds within the present. Mixing the cities of today with beings that are otherworldly has become a passion. Her love of things that go bump in the night or aren’t quite tangible on this plane of existence, really didn’t start until she was in her teens and she fell in love with a movie about a pack of rowdy teen vampires (thank you Lost Boys). Her love affair of the paranormal and urban fantasy was born and it seemed only natural to incorporate that into her writing. When she’s not writing, her pastimes include hanging out with her boys, daydreaming, drawing, and reading so she can live vicariously through the characters her peers breathe to life. Indulgences? Why cowboys, vampires, werewolves and faeries… oh my! Her stories are often filled with the magic of love and the mayhem that ensues, which always threatens to keep her couples apart. She writes paranormal romance, urban fantasies, and contemporary western romances. She has published three books. 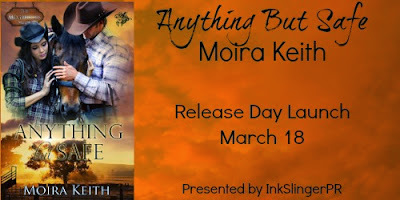 Buckling Down, a contemporary western romance, was her debut book. Then in August 2012, Moira introduced the world to her Urban Fantasy work with the debut book in the Moonlight Trilogy, Blood and Moonlight. Her most recent release, Frost, is a holiday novella and the first in a planned holiday series. 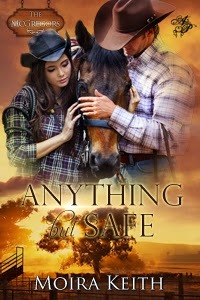 She recently contracted a contemporary western romance, Anything but Safe with Astraea Press, slated for release in the spring of 2014. At the time of posting, there was no link on goodreads, or to buy yet. I love the good book description and excerpt. It is a very interesting book to find out how far one would go to protect the very people one loves.